My wife bought me this tool for my birthday probably six years ago. 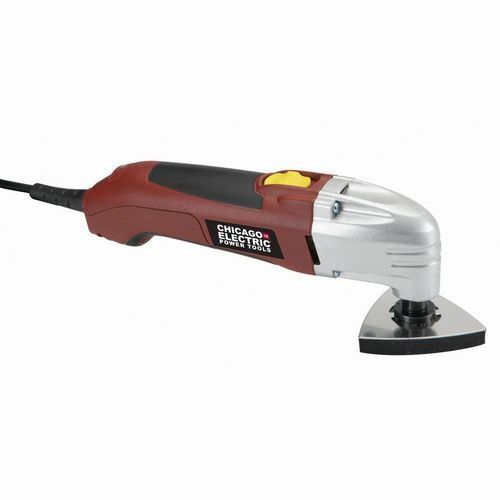 I have used it for demolition and construction to cut copper pipes and wood, to sand where no other sander whould have done the job and for many other things. This tool took me out of a bind countless time. This is a wonderful little detail sander. This morning I used it again to trim pieces of wood where not other tool could have done it. If you do not already have one of this, go buy one. Thanks for the review! I’m always looking for something to use my coupons for at Harbor Freight and this might be up my alley. I just hope the new versions they carry are similar to the older version you use. Regardless, I’ll use it so little that I’d bet it lasts just fine for me. HF fills that niche nicely in my toolbox. $14.99 with the super coupon. I use an oscillating multi tool a lot. My advise to anyone is to spend a few dollars more, and get the variable speed model: it does make a difference. Bought one two years ago while replacing sofit and facia on my house. Still going strong. Well worth the money. Can’t imagine why I would need the variable speed model. Just something else to break. I always wondered about the usefulness of these… For $14.99.. well I’m gonna get one. It is much more than a sander. A jamb saw, laminate trimmer, linoleum scraper, tubing cutter… I could go on. I have a Bosch, but in theory they are the same tool. Great tool. You don’t really need the variable speed until you really need the variable speed. There are some sanding jobs — and cutting, too — where the slower speed does a better job. They are a great type of tool ,I have the original Fein and it does many operations other tools can’t. I think you might be a little off as to how long you’ve had yours The Fein’s muti tool’s patent ran out towards the end of 2009,no one made them except Fein up to that point. Jim,I have been married for the second time for close to 9 years, my wife bought me this toll soon after (may one or two years)we were married to remold our house. So I think that 6 years in the ballpark. I think the first copy-cat was the Rockwell Sonicrafter (which I have: great tool). I can’t be certain of that, but it seem like the Sonicrafter was the go-to multi-tool for those like me who couldn’t afford the Fein. I’ve been wrong before Bert,but I thought Harbor freight was last to come out with them after Bosch and Porter cable. Grizzly’s blades for these are half the cost (or less) compared to anybody else’s blades (including HF). They have a “Japanese style” blade (coarse teeth, supposedly for hardwoods) that is very impressive. Cuts fast, and stays sharp. They are universal blades, able to fit many brands.